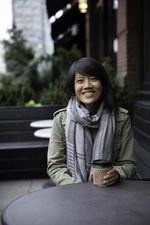 Karina Yan Glaser is the author of the middle-grade debut The Vanderbeekers of 141st Street (HMH Books for Young Readers), a Summer/Fall 2017 Indies Introduce selection and an Autumn Kids’ Indie Next List pick. Kate Schlademan of The Learned Owl Book Shop in Hudson, Ohio, served on the Indies Introduce panel that selected The Vanderbeekers of 141st Street, the story of a family on the verge of losing the only home they have ever known when their landlord, Mr. Biederman, decides not to renew their lease. Glaser grew up in California and now lives in New York City, where she is a contributing editor for Book Riot, writing children’s book recommendations and the weekly newsletter The Kids Are Alright. Here, Schlademan and Glaser discuss the inspiration for some of the characters in the book and the process of getting published. Kate Schlademan: Your debut features a large nuclear family consisting of two parents and five children. How were you able to write the relationships so well, especially between the twins? Do you come from a big family? Karina Yan Glaser: I do not come from a big family, but I love reading about them in children’s books! My family are immigrants from China, and I was the first one in my family line to be born in America. As with many new immigrants, we were quite isolated, and I turned to books in my loneliness. I longed for the big, bustling families I read about in books like All-of-a-Kind Family by Sydney Taylor, The Saturdays by Elizabeth Enright, or The Moffats by Eleanor Estes. When I envisioned the Vanderbeeker kids, I drew a lot of inspiration from the family I am raising now and the neighborhood we live in. With regards to the twins, I tried to create a balance of them being their own people but also being very much dependent on each other. My husband has a twin brother, and I thought a lot about the stories he’s told me about their relationship growing up. And, of course, as a writer I am always observing the people around me so I can write about the imaginary kids in my stories in authentic ways. KS: Was there a Mr. Biederman in your life that you based his character on? If so, were you able to win him over, or was not being able to connect an inspiration for the story? KYG: I have lived in New York City for nearly 20 years, and neighbor dynamics are always so fascinating to me. After I graduated college, I flew back home to California to pick up my dog and bring him to live with me in New York. He was an older dog (I had gotten him when I started high school), and he had a lot of separation anxiety and would bark when I was at work. Unfortunately, the upstairs neighbor worked nights and slept during the day, and my dog’s incessant barking kept him up. He wrote me a (not very nice) letter expressing his displeasure, and I felt terrible! I wrote him a very apologetic letter back describing the situation, bought him a white noise machine, and tried to soundproof our apartment the best I could. He ended up being very understanding and grateful for our efforts — thank goodness! Now we live in a 70-unit co-op in Harlem, and I have to say that these are the best neighbors I’ve ever had. Some of them have inspired characters in The Vanderbeekers of 141st Street. But even a great building still has troubles; I was on the co-op board for four years, and, wow, I heard about a LOT of neighbor drama. I guess it’s part of what makes living in an apartment building so unique and interesting! KS: As I was reading, I felt that the Vanderbeekers’ brownstone was also a character, with its own history and the way it made its inhabitants feel. Was it your intention for the house to be a character from the start, or did it take on life as you wrote? KYG: When I was writing drafts of this book, I played around a lot with how to portray the brownstone. It was such an integral setting in the story, and I let my mind wander and even wrote about previous inhabitants of the building and what the brownstone might have seen in its 100 years of existence. In a draft that my writing teacher read, he pointed to a section of the story where the twins are in the basement and the brownstone seemed to breathe all around them. My teacher said, “I want more of THAT.” So, I gave myself the freedom to insert more of that into the story. I think it also created a tension of how important it was for the kids to stay there… because the brownstone loved them as much as they loved the brownstone. KS: I was very excited to hear news of a sequel. Did you always have a second story in mind, or did it come about later? Is it possible there is even more in store for the Vanderbeekers? KYG: I’m excited about the sequel, too! Initially, I was working on a standalone for the second book in my contract with Houghton Mifflin Harcourt. About a year ago, I got an e-mail from my wonderful editor, Ann Rider, asking for my thoughts about a Vanderbeekers sequel. I was thrilled to return to the Vanderbeeker family, and I think in my subconscious I was always imagining another story, another adventure, for them. There might be more in the future — I sure hope so! KS: What advice would you give to someone looking to get their debut novel published? KYG: There were a few things that were very helpful to me as I wrote my first book. First, I wrote the whole first draft during National Novel Writing Month (NaNoWriMo), which is an annual event in November where people are challenged to write 50,000 words of a novel in one month. There’s a cool online progress tracker and you get a badge if you complete the challenge — I’m such a sucker for things like that! Second, I took two semesters of writing class. I learned how to give and take critique, plus I made great connections to my two teachers (who I still go to for advice even now). Third, after lots (and lots) of revision, I did extensive research into agents before I started querying. I wanted to make sure I was only sending queries to agents who were looking for stories in my targeted age group and genre, and I also wanted to make sure I was familiar with other work the agent represented in the past. Finally, I learned that the book journey is a process, and that it is best to be patient! 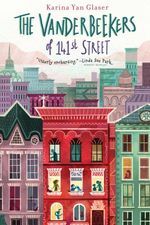 The Vanderbeekers of 141st Street by Karina Yan Glaser (HMH Books for Young Readers, Hardcover, Middle Grade, $16.99, 9780544876392) On Sale Date: November 11, 2017. Learn more about the author at karinaglaser.com.